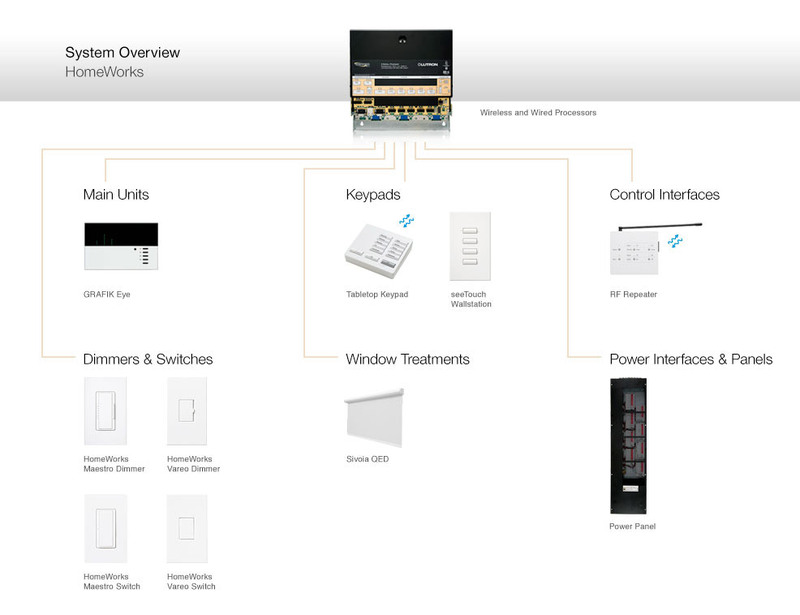 The diagram above provides an overview of the components that constitute the HomeWorks system, as well as compatible Lutron products. You can refer to the categorized list below to find a complete list of components with more detail about select products. The GRAFIK Eye main unit allows for the control of multiple lighting and shading zones. The HomeWorks system uses the following dimmers and switches for reliable, convenient light control. Control the speed and function of your fans with these Maestro style controls. HomeWorks uses the following interfaces for convenient, reliable light control. Control the HomeWorks system at the touch of a button with programmable, easy-to-use keypads. For increased flexibility, extend the reach of your light control system with a companion control. Power interfaces and panels allow wallstation and dimmer panel links to extend beyond their normal distances.